The roof is the most important part of the home, it keeps the elements out and protects your structure. 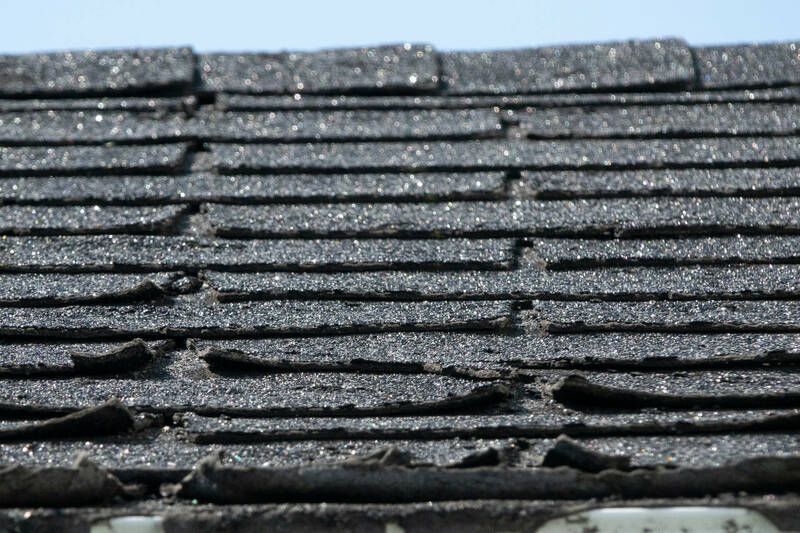 Worn or damaged asphalt roof shingles can allow water to leak into the building. Leaks can be major causing damage to insulation, drywall, and your belongings, or they can be small, rotting your roof sheathing and rafters setting your home up for a costly repair. 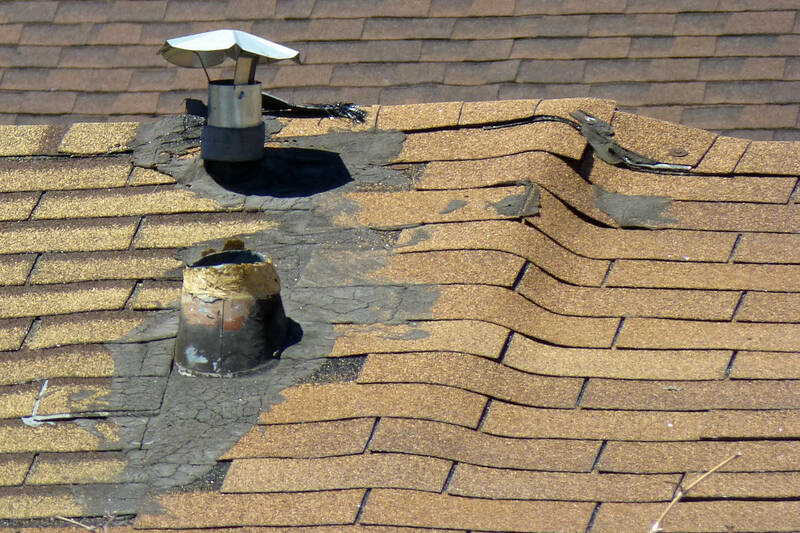 There are several warning signs that your asphalt shingles need to be repaired or replaced. The first step to evaluating your roof is to closely inspect the shingles. There are a few indicators that asphalt shingles are worn or damaged and that the roof is in need of repair. Use binoculars to get a good look or safely use a ladder to climb up to the roof to inspect. Remember to be safe at all times if you climb on a ladder and follow ladder safety best practices. 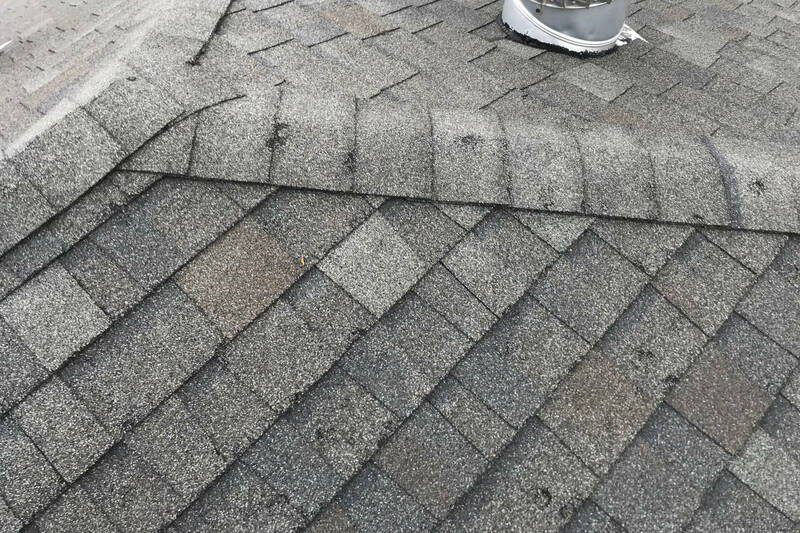 An obvious warning sign that there are problems with a roof are missing shingles, exposing the upper portion of the lower course of shingles to the elements. Storms and high winds are usually to blame for this. The missing shingles can allow water to more easily penetrate into the attic. If the roof is in good condition overall it may be possible to replace the section that has been damaged. 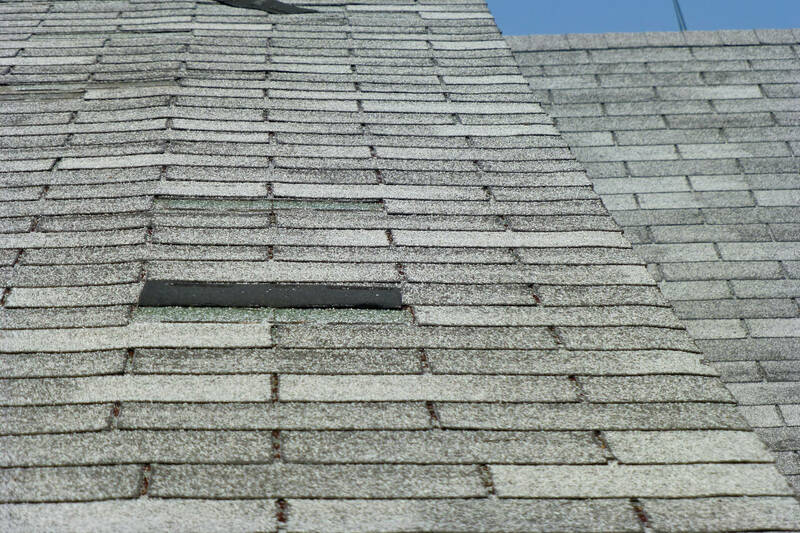 Shingles that are lifted at the bottom can be susceptible water damage and being blown off in high winds. This issue is often caused by the shingles not sealing properly to the roof, potentially due to an uneven roof or installation in very cold weather. Shingles that are curled on the corners or edge can allow water to penetrate the roof. Curled shingles are often a sign that the roof has reached the end of its lifespan. 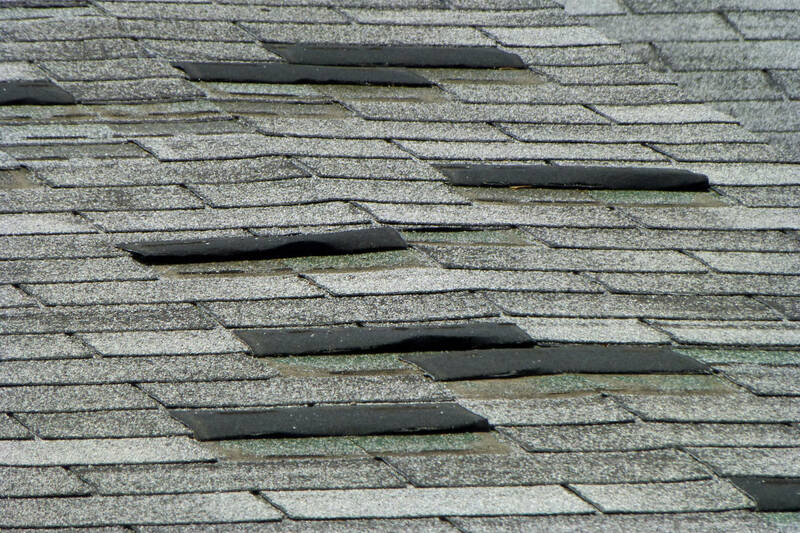 Curled shingles could also be an indicator that the attic is poorly ventilated causing it to age prematurely. Cracks in the roof shingles allow an easy entry point for water to penetrate beneath the surface and into the home. Cracks can be caused by high winds, temperature swings, manufacturing defects, and improper installation. 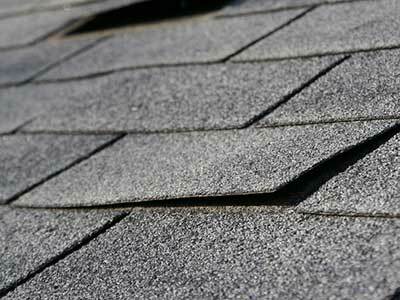 If you spot cracks you should consider complete shingle replacement. Buckling shingles can be caused by moisture in the roof sheathing or felt paper, causing it to expand and buckle. This typically occurs when the sheathing is installed too tightly so it cannot expand and contract. This could also indicate poor attic ventilation exacerbating the problem. Unfortunately, repairing buckling shingles often requires removing the shingles and repairing or replacing the sheathing. Asphalt shingles are essentially a layer of tar coated with granules of rock which protect the surface. 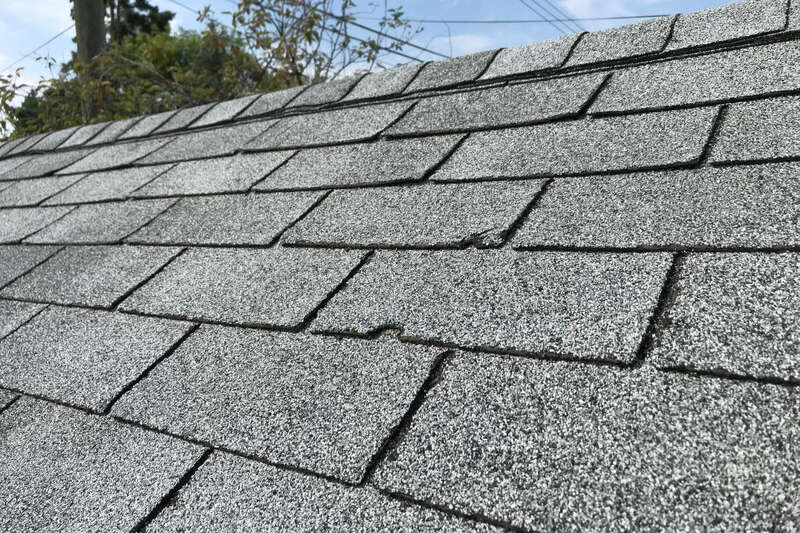 As a roof wears the granules can come off the surface, weakening the shingle. Dark spots on the shingles may indicate that granules have worn away. Large amounts of granules in the gutter or downspouts may indicate that the roof is wearing quickly. If the shingles are missing granules it may soon need to be replaced. Flashing is a metal or tar strip that prevents water from penetrating cracks, gaps, and valleys in a roof. Flashing is extremely important for preventing water leaks and damage. If you spot flashing that is missing or if you see lifting, separating, gaps or cracks in the flashing a repair is needed. Also look for cracked, dried, or missing caulking that may need to be replaced. 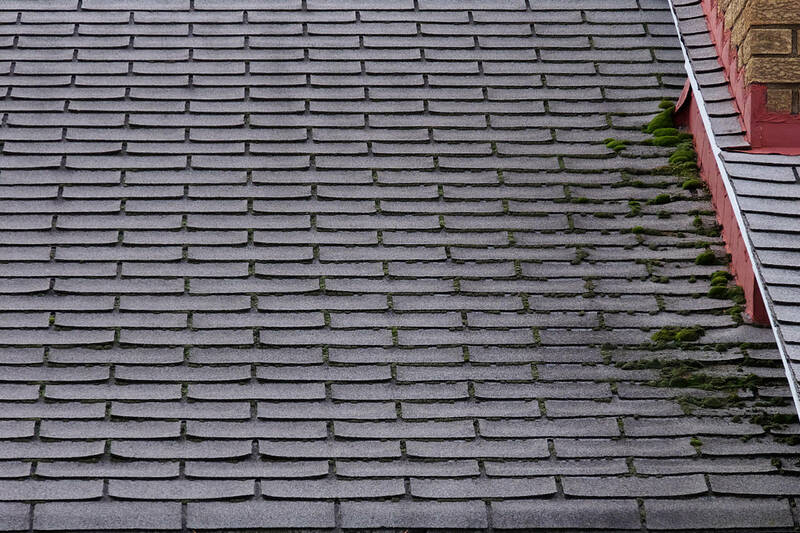 Large amounts of moss, moisture, or mold may indicate an issue with the roof not drying out. 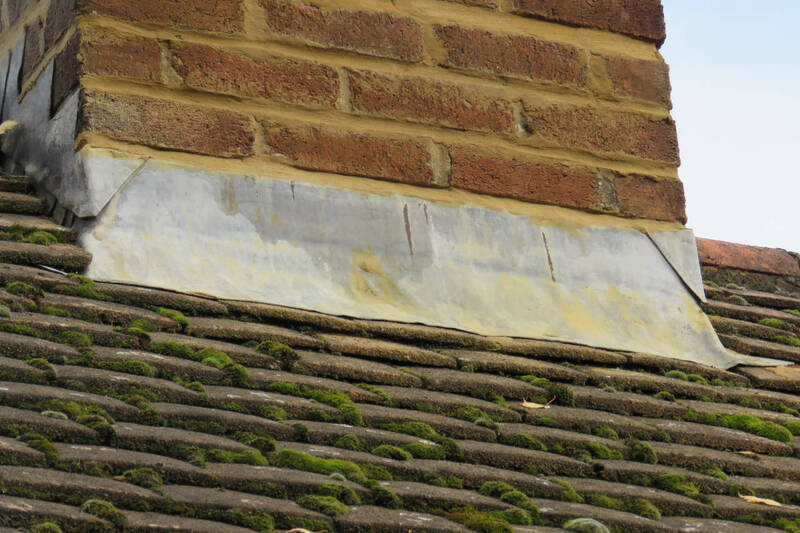 Moss holds moisture against the roof and may increase the likelihood of leaks. It is usually the result of being shaded most of the day. Additionally, this condition is often unsightly and affects the curb appeal of your home. Fortunately, there are several methods for removing moss and mold from a roof. 3-tab asphalt shingle typically last 15-18 years while architectural shingles often last 20-25 years. If the age of your shingles fall into this range it is a warning sign that you should look very closely at the condition and that a replacement may be needed. Look for a worn appearance of the shingles. Checking the attic is another good way to see if there are issues or defects in the roof. If you have access to your attic, bring a flashlight and look for additional warning signs. Sunlight should not be seen in the attic unless you have a window or skylight. Sunlight can identify holes in the roof that need to be addressed. Look at the underside of the roof sheathing for water drips or water stains. Stains on the sheathing are a sign that water has been leaking in the area. Keep in mind that it’s possible that stains are old and that leaks have already been corrected. Consult with a professional to identify if the stains indicate a current leak or an old leak that has been repaired. Look for damaged, rotten, or missing sheathing on the underside of the roof. This could indicate a water problem and a safety hazard for someone walking on the roof in the future. Damage to sheathing could allow the roof to wear prematurely. Replacing a roof is a major investment, in many cases it may be possible to repair a roof without completely replacing it. Learn more about how much a new roof costs. If it’s newer or in overall good condition it may be worthwhile considering a repair. If it’s older and has many issues it might be best to replace the entire roof rather than repairing it. Consult with a roofing professional to find the best option for you. Use our roofing calculator to find how much material is needed for a replacement project. Also see our roof pitch calculator if you need to find the pitch or angle. Calculate how many metal roofing panels are needed to cover a roof.